Happy December! 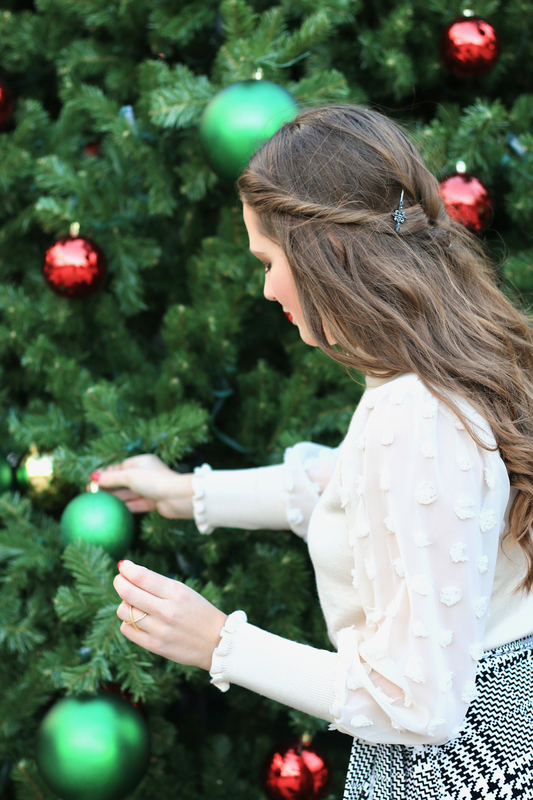 It just wouldn't be the Christmas season on my blog until I shared some photos with a huge decorated tree, right? 😉Sharing this year's edition of my blog Christmas photos today, as well as a few of my own personal Christmas traditions! Each year I like to do some sort of a dressy look for my Christmas tree photos, but I do something a little different each year. I haven't done a dress and skirt combination since 2015 (the first year I did these type of photos for the blog! ), so it felt right to bring it back. 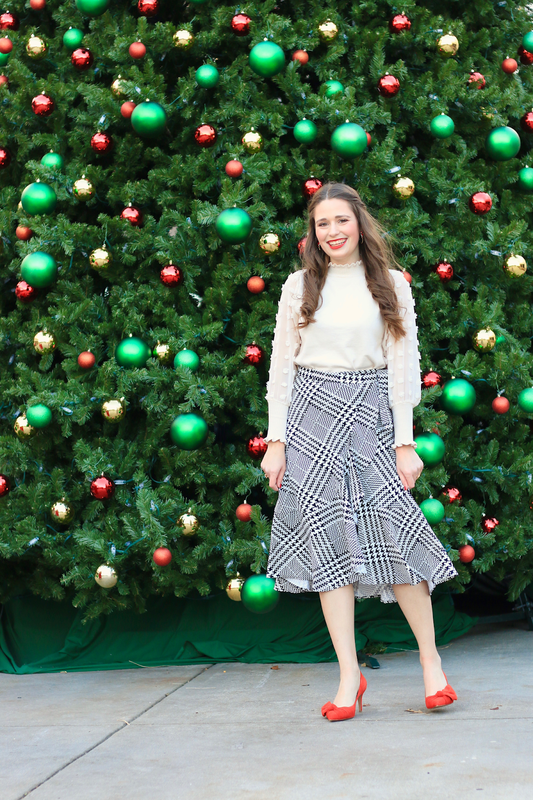 Both my white sweater and this fun wrap midi skirt are from Chicwish, which has become one of my favorite retailers for unique pieces. 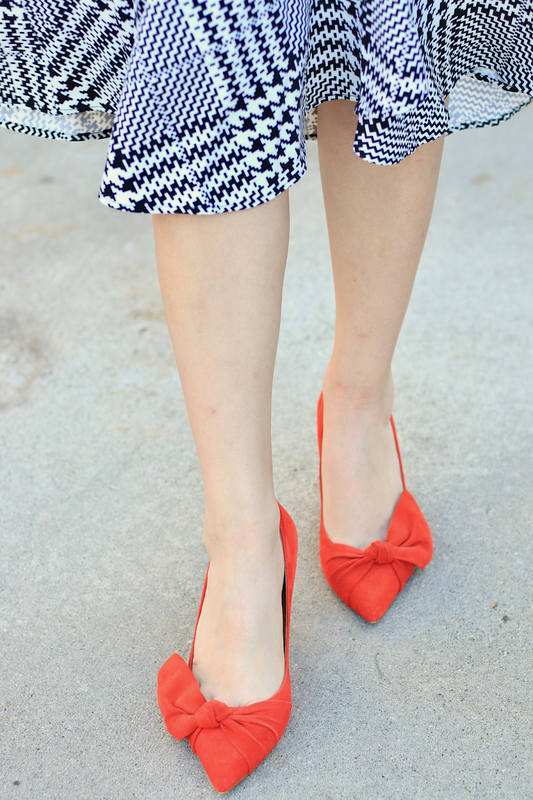 I thought I'd add in a little color by pairing this look with my favorite pair of red bow pumps! Red shoes just scream Christmas to me. The wreath that I'm holding in these photos is very special to me! I made this last year on Thanksgiving in Vermont. I wasn't able to travel for that holiday last year with my work schedule, so I went for Thanksgiving dinner at the house of a family that went to my Vermont church. My friend Anna also wasn't able to travel home for the holiday, so she joined as well. After eating, we had a Christmas crafting session, where we each made a wreath! I picked out the ribbon and accessories on mine from Hobby Lobby. I still can't believe that I made what was literally my dream wreath! Maybe next year I'll bring back the tradition of doing Christmas crafts on Thanksgiving. Set up my Christmas tree on November 1st (est. 2016): Fall 2016 was a really rough season of life for me. By the end of October, I was ready to bring on as much early Christmas cheer as possible! That year I decided to set up my Christmas tree on November 1st. It was also the first year that I had a Christmas tree of my very own, and my first year living in an apartment. Since then, I've continued to set-up the tree on November 1st. The past two years, I have decorated it later in November, but I still make sure to at least get the tree out of the box on November 1st! The season is so short as is, why not enjoy your beautiful tree for a little longer? Take Christmas photos for the blog (est. 2015): Well- you're looking at that blog post today! Here are my past Christmas photos from 2015, 2016, and 2017. Design a Christmas card and send to friends and family (est. 2016): Since I went to college out-of-state and have lived in two additional states since then, it's safe to say that most of my closest friends and family are far away! I always loved when my family received Christmas cards when I grew up, so I wanted to start that tradition for myself after I was out of college. Weirdly I don't use the Christmas photos that I take for the blog each year for my card, I usually select another favorite photo or photos from the year. I love how my cards turned out this year and I've already started sending them! Watch a Hallmark or Lifetime movie premiere (est. 2017): Last year in Vermont I got VERY into Hallmark and Lifetime Christmas movies. Most of them play on repeat throughout the season, but I think there is something really fun about being able to catch a live premiere! This year I watched the premiere of Christmas at Graceland on Hallmark (starring Kellie Pickler), and I hope to watch at least one more premiere live before the season is over. That's all of my Christmas traditions for now, but I'm thinking that it might be fun to add a new one into the mix each year going forward! I think the next one that I add will be faith based. 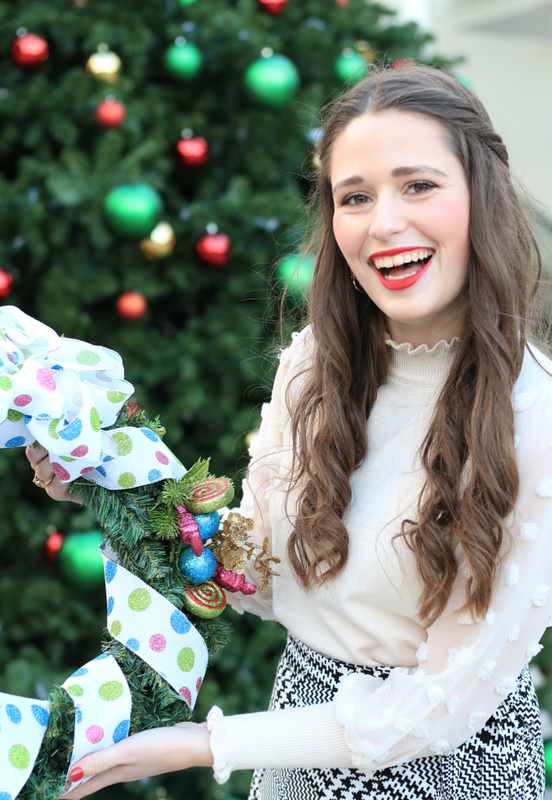 I'd love to hear some of your Christmas traditions- especially if you have some and you're a single gal like I am! One last fun thing to end today's blog post with! 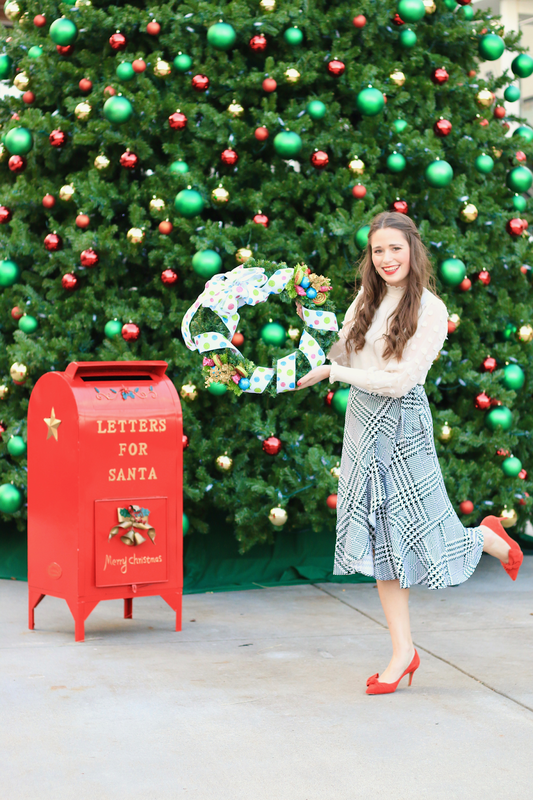 I'm teaming up with some other bloggers to bring you a fabulous holiday giveaway. It's super easy to enter (if you follow me on social media already, those are free entries basically!). Hallmark stays on my TV 24/7, haha! The movies are so cheesy but so comforting and feel good! These are beautiful pictures! I love the outfit, especially the shirt and red shoe combo. What a great tradition! Ahhh I love these photos girlfriend! I love sending out Christmas cards every year; I'm a bit behind this year and need to get it together ASAP. A, I LOVE these pics! You look amazing! And i loved learning about your holiday traditions! I am OBSESSED with Hallmark movies too, though my obsession started when I lived in Connecticut. Something about those New England winters right? You look so darn cute! I love those darling shoes. They came out so cute! I love what you wore and that backdrop! I love everything about this look! 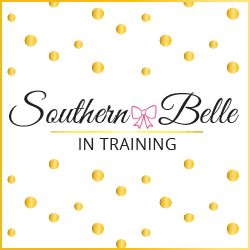 Super girly, elegant, and festive. And I like the red lip on you! Great post!